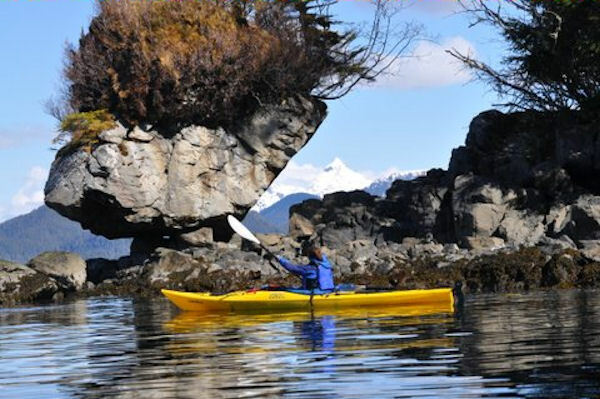 This half-day paddle & cruise adventure is the perfect introduction to the wild side of Sitka Sound, beginning with a fun and informative kayak skills & safety orientation. The Guide will explain the variables to be considered in designing the day’s unique float plan, and, once afloat, you’ll have some time to dabble about in the crystal clear shallows, getting comfortable with your craft, before we set out to explore our first group of islands. While paddling through mazes of reef and kelp forest – areas accessible only by kayak – your interpreter/guide will help identify the colorful marine life visible below, including: crab, sea stars, anemones, sea urchins, jelly fish and more. At the surface, in addition to the star of the show – the ever amusing sea otter – we also frequently sight harbor seals, sea lions, porpoise, bald eagles, and a variety of marine birds. We’ll step ashore on a seldom-visited island to stretch our legs, do a little beachcombing, and enjoy a hearty snack while soaking in the majestic wildness and amazing views of the Sound. Our guide will explain some of the ecology of the area, and also tell you about the Tlingit people, who still harvest the ocean’s bounty using knowledge passed down since the last ice age. This half-day wilderness exploration concludes with an exciting 30-minute boat cruise to Sitka. Please note: This adventure is also conducted in reverse order, with the cruise outbound, followed by a paddle return to Sitka. Minimum age to participate in this tour is 6 years old, minimum weight is 40 pounds and maximum weight is 275 pounds with a maximum height of 6 feet 6 inches. You will want to be dressed in layers, comfortable shoes and a warm hat. Other recommendations are to bring sunglasses, a camera, binoculars, gloves and raingear. Please note: This adventure is also conducted in reverse order, with the cruise outbound, followed by a paddle return to Sitka. Minimum age to participate in this tour is 6 years old, minimum weight is 40 pounds and maximum weight is 275 pounds with a maximum height of 6 feet 6 inches.